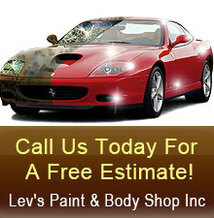 Lev's Paint & Body Shop is dedicated to giving our Richmond, Texas area customers quality collision repair at a competitive price. Our success is accredited to our referrals, which we are proud to say is a result of our dedication to complete satisfaction of our Richmond customers. Customer service has always been a top priority with our shop, which is proven through our many lifelong Richmond customers. We have a tremendous track record servicing both foreign and domestic cars and trucks.